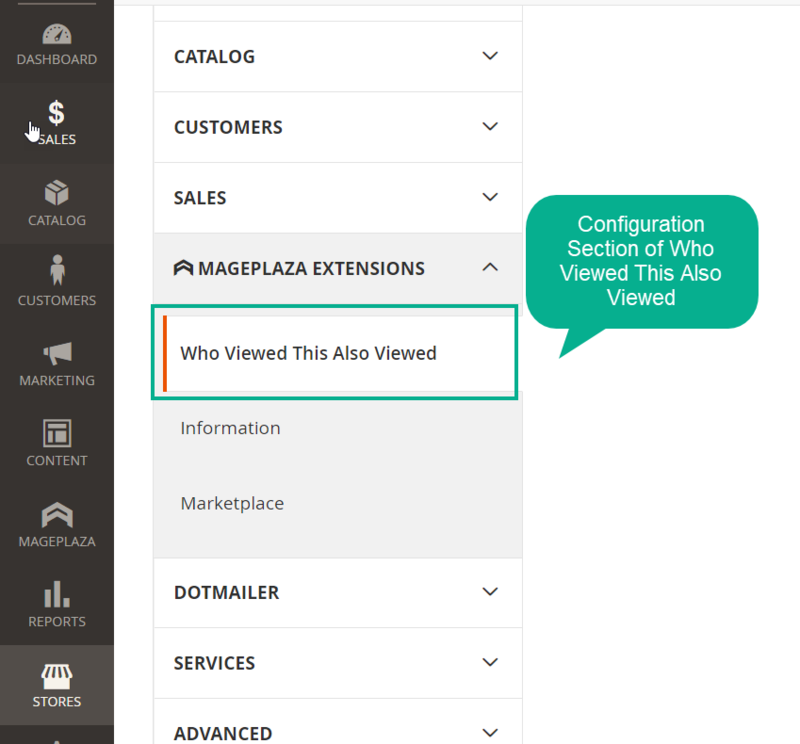 Magento 2 Who Viewed This Also Viewed extension by Mageplaza allows suggesting a group of related products which are viewed by other customers in a period of time to the current viewer. This is an effective tool for online stores to introduce cross-sell or up-sell products, and boost up sales significantly. As a customer, you are likely to be curious about what products are also concerned by others. You would like to know to view accordingly and find the preferred items more quickly. The common block - “You may also like” is also a suggestion for customers but it lacks credibility. Customers can easily realize this is some kind of promotion plan of the store. As a result, they do not pay too much attention to this kind of products. It is easy to mix sales opportunities with also-viewed product suggestion. Stores can do cross-selling and up-selling with the recommended products of the higher price, or from the same categories. A customer can know the action view of others, know the concerned products, find the related items. As a result, they can quickly find out their favorite items and find the store suggestions helpful. They feel satisfied and would like to come back next times. Customers Also Viewed extension allows displaying suggested products with various product types. Therefore, there is not any restriction for stores to show suggested also-viewed products to potential customers. Besides, products in any available categories can be shown with ease just via clicks for selecting from admin backend. Depending on each sales campaign, store owners can decide where to show the also-view product lists suitably and effectively. Interestingly, the suggested product block can be shown in two different style: multi-line or in slider. 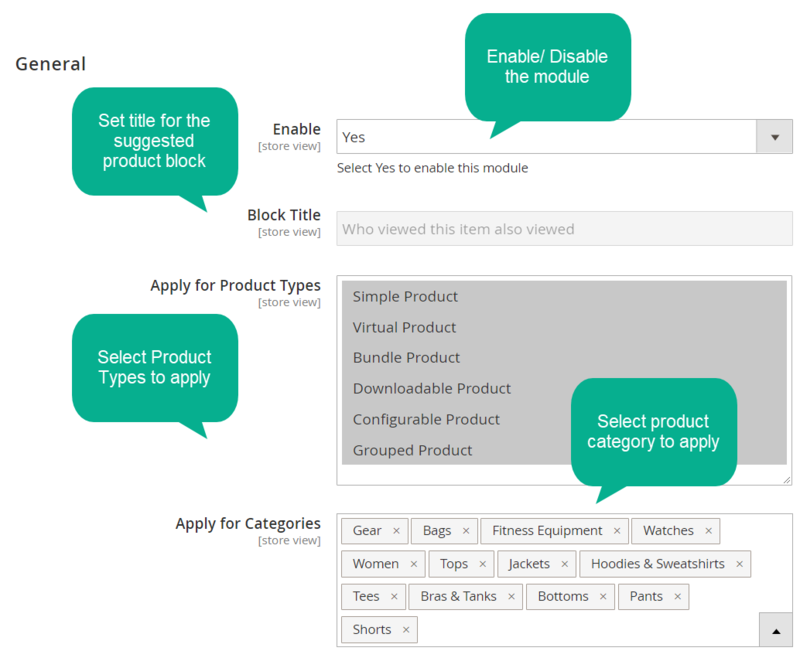 With Multi-line style, also-viewed products will be listed in static rows. This style is suitable when there are not many products and customers can take a look quickly all items. Meanwhile, Slider style helps stores show suggested products in a moving slider, which makes the appearance more vivid and eye-catching by moving effect. Slider works effectively when there are many products to show and attract customers’ notice. With higher price: Only show also-viewed products with a higher price than the currently-viewed product. In stock: Only show also-viewed products which are available in stock. 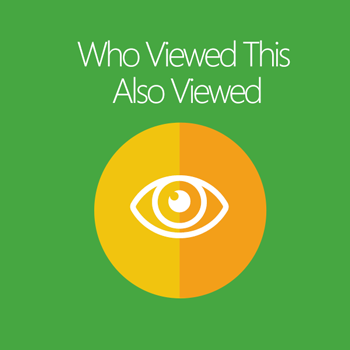 In the same category: Only show also-viewed products which are in the same category with the currently-viewed product. 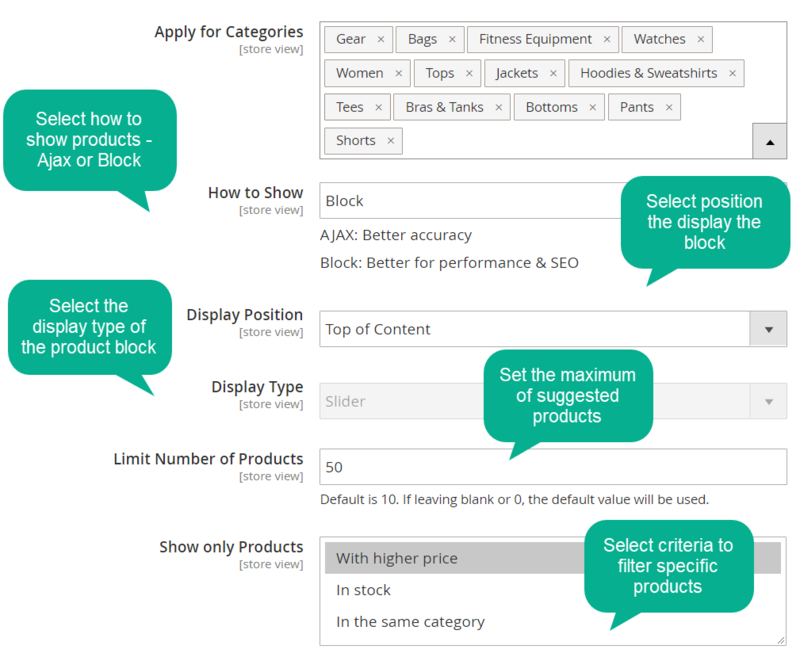 Filtering suggested products aims that customers are not confused and focus on a product group with the same specific criteria easily. filter_drama What types of products can be used in this extension? Who Viewed This Also Viewed can be applied to all product types including Simple Product, Virtual Product, Bundle Product, Downloadable Product, Configurable Product and Group Product. filter_drama Does the extension support all categories of products? Yes, all the available categories of your store are supported in this extension. filter_drama How does the product block show? filter_drama How many positions can I show the suggested block? filter_drama In which way the products are shown in the block? The products can be shown in a moving slider or in static multi-lines. filter_drama Can I restrict the number of products to be shown? filter_drama Can I filter to display only products in the same category but with the higher price? Yes, it can be done easily from the Show only Products section from the backend. filter_drama I would like to set a period of time for collecting results. How can I do? From Check Data in the last (days) section, please fill a number of days to collect the data. filter_drama Can I arrange the product order by price ascending? Yes. 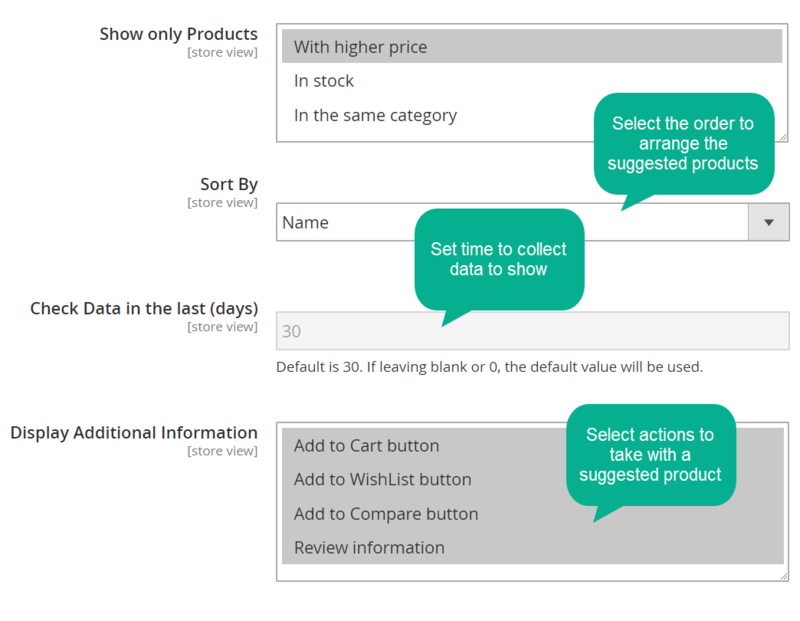 You can select to arrange the order by price, name, relevancy or quantity in Sort By section. filter_drama Can I add a suggested product to cart quickly from block? Yes, you totally can do it. The extension support you to add the recommended items to Cart/ Wishlist/ Compare list quickly right from the block.